Two years ago, I ate the kebab to end all kebabs. My always-hungry friend Z was visiting. I had an appointment to get my hair cut on Church Street, near Marylebone. I told him he could come along, poke around the antique sellers, and get a kebab from Lahore restaurant across the street, which sets up a kebab stall on market days. An hour into my appointment Z turned up with the most gorgeous lamb shish roll. The lamb was succulent, tender, and medium-rare with a hint of char, and complemented by crunchy salad, the homemade roti wrap was warm with that perfect chewy bite to it, and the sauces – one a garlicky yogurt sauce, and one a hot sauce – struck just the right balance of salty, savory, tangy, and spicy. The kebab plunged us into a fevered discussion of why there are no proper kebab shops in Seattle and spawned my quest to try all the delicious kebab rolls in London. When I went back to Lahore restaurant, it wasn’t a full market day, so their stall wasn’t set up outside. The menu in the restaurant, however, offered three potential options. A kebab roll (£3), a chicken tikka roll (£4.50) or a paneer tikka roll (£4.50). I opted for the kebab roll, which I requested “spicy.” The sweet-faced server smiled at me beatifically. A word to the wise – they don’t mess around with the spicy. My roll was LADEN with finely sliced raw green chilies. The kebab itself was a lamb kofte kebab – i.e., minced, spiced, skewered and grilled lamb meat. It was a perfect medium rare, tender and toothsome, with a salad of finely sliced onions and cucumbers, and a light yogurt sauce, wrapped in a grill-blackened homemade roti. It shouldn’t be any surprise that the kebab was so tasty; Lahore Restaurant is the sister to Lahore Kebab House in Whitechapel, home to some of the best Punjabi food in London. I initially conceived of this blog post during a period of extreme budgetary crisis. The idea was that I’d cook on a strict budget at home. My only indulgence would be an occasional kebab. 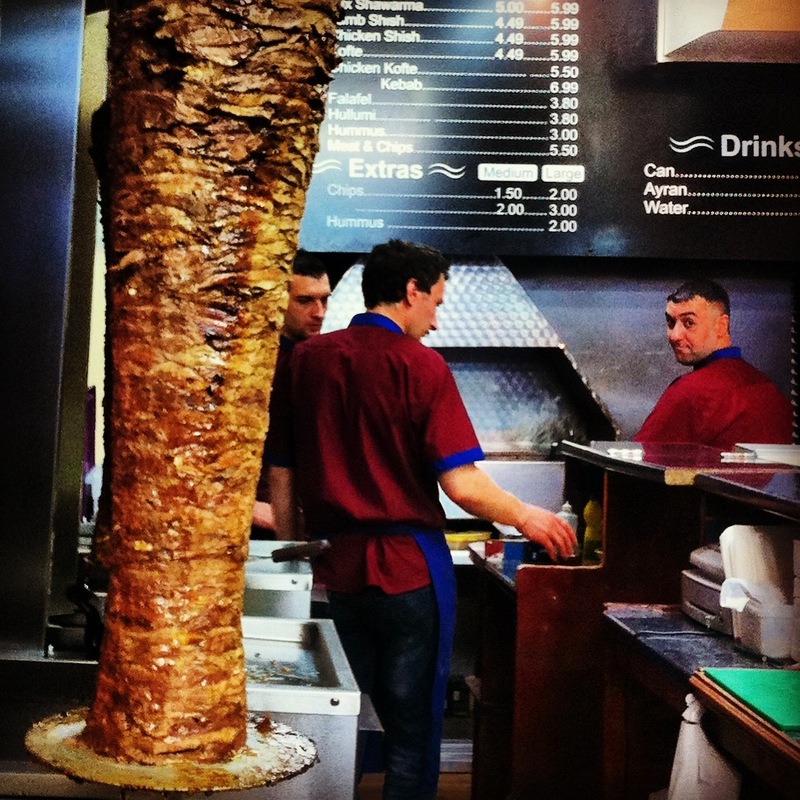 Eventually, I would compile an exhaustive inventory of London’s best kebab shops. I pictured myself – dedicated, soldierly – trekking from Shepherd’s Bush to Dalston, an aesthete in search of empyrean kebab perfection. After ticking off Lahore Restaurant, I ate two disappointingly mediocre kebabs on Edgware Road. So far I was on track. My plan was upended, however, when I achieved kebab nirvana. Rather than settle for a lesser kebab, I journeyed repeatedly to Kentish Town for the same glorious lamb shawarma, first from Kilburn, then from southeast London. I am speaking of course, of E. Mono. E. Mono sits behind a discreet narrow Victorian storefront on Kentish Town Road, near the Kentish Town Post Office. Giles Coren, who lives in the neighborhood, wrote a rave review last year, and reportedly kebab lovers now make the pilgrimage from as far away as Oxford to worship at E. Mono’s succulent lamby altar. The menu is fairly Spartan: you can have lamb or chicken shawarma, lamb or chicken shish, or lamb or chicken kofte. Vegetarians can opt for falafel or halloumi. I have been to E. Mono probably a dozen times, but I have never been able to order anything but the lamb shawarma, which, at £4.49 for a “medium” wrap, offers a stupendous amount of meat in a chewy wrap, with cabbage, pickle, salad, and hot sauce. (A large wrap, for £5.99, doubles the meat. For serious meat eaters only.) E. Mono prepares its own elephant legs, and this detail sets E. Mono’s succulent, flavourful, wonderfully juicy lamb apart from the run-of-the-mill kebab shops that dot the streets of London. Smouldering, laconic Turkish men with firm jaws use a wicked two-foot knife to carve away slivers of sizzling shawarma into a flat shovel. They are careful to include some of the well-roasted bits from the edges as well as meat from the juicy center. Last time I went I brought friend N*, who lives nearby. It was her first visit. We took the seats at the tiny counter (there are only two) and happily gnawed our way through our massive shawarma rolls. By the time I finished, I was panting like a skin diver. Afterwards, impossibly full, we walked up Kentish Town Road, grinning and smacking our lips. “I have the most wonderful flavour of lamb in my mouth,” said N. “So do I,” I said. I was already wondering whether, possibly, after a couple of hours respite I could manage another kebab roll. * N came up with the wonderful title for this post. This entry was posted in Budget, I'd eat here again, Indian, Kentish Town, London Restaurants and Reviews by Area, Must try!, St. John's Wood, Turkish and tagged kebabs, Lamb, London, Meat by Susan. Bookmark the permalink. Lahore and E. Mono sound incredible. The next time that I am in London, you must take me! Lahore is excellent – this reminds me that I must go there again soon! I love the halloumi there! Copyright to all text and images on this site owned by Susan Wilk. All rights reserved.